I love running up and down mountains and I am getting better at it all the time. I also chase the challenge of new heights, so when I first read about the tallest peak in the northeast only 3 hours away, I was all in to win. 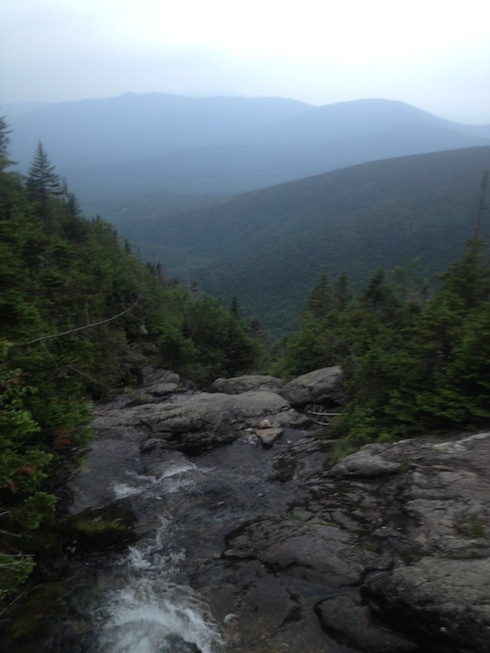 Mount Washington, at 6,288 feet high, is the tallest mountain in the northeastern part of the United States. The mountain is part of what is known as the Presidential Range, which is a section of the White Mountains of New Hampshire, with various mountains that are named for different presidents such as Franklin Pierce, Dwight Eisenhower and James Madison. Mount Washington is within the White Mountain National Forest and the mountain’s summit is accessible by automobile, by foot and by a railway that brings visitors to the top. Although the summit may seem less daunting than some of the 14,000 footers of the west what makes Washington treacherous is the weather and rate of climb. Below are some highlights of the historical weather monitoring atop Mount Washington. The weather on Mount Washington’s summit is among some of the most studied in the world and also among the worst. The highest wind speed ever recorded on this planet’s surface occurred on Mount Washington on April 12th, 1934. The wind that day was a fierce 231 miles per hour. 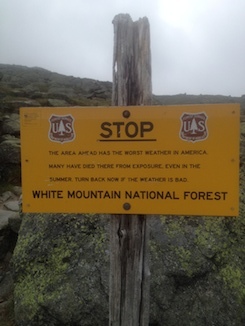 The weather on Mount Washington can seemingly change in a few minutes and over the years many hikers have been caught in terrible conditions and have suffered the consequences, which often include death. The average wind speed on the top is 35 miles per hour and the average temperature for a typical year is just 26 degrees Fahrenheit. The highest recorded temperature was 72 degrees with the lowest being -47 degrees. It is capable of snowing anytime of the year on Mount Washington’s summit, which was proven in August of 1965 when the peak received 8 inches. As for the rate of climb, although the distance to the top is 6,288, the ascent is over 4,000 feet in a distance just shy of 5 miles. That is straight up the mountain. The rocks are large and slick, which demands focus and strength. Most hikers never make it to the top because of weather and fatigue. Some good advise given to me was not to underestimate the altitude and be prepared for 40 degrees of climate change. I took the advise and planned a route. For those who know me, you know I am not a planner, however, this felt different, this felt dangerous. At last count 135 people have perished attempting to summit the mountain and countless hospitalized from hypothermia and exposure. I thought it best to make a plan. 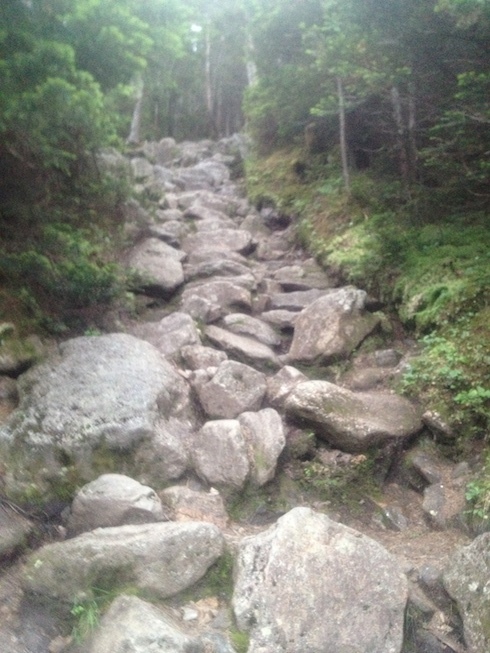 I started early, 5:00am, at the Ammonoosuc Trailhead. I had enough supplies for 3 hours of running. The average hike time to summit back to the base camp is 6.5 hours. I was hoping to at least cut that in half. The following is a list of my supplies, mind you it’s the middle of July. I brought a map, compass, winter coat, gloves, long sleeve cotton shirt, winter hat + visor, 600 calories of nutrition, and 48 ounces of water. I started my watch and trotted into the dense forest that is the White Mountain State Park. It was dark, I had a headlamp on, but it was clear to me that I had lost the trail within the first half mile. Forgive me, I’ve never been here, I don’t know the terrain, and now I am thinking it might be better to stop and do this with a guide, or at least wait until daylight. I also noticed one of my 24 ounce water bottles was missing. How that fell out without me noticing is baffling, but it did. Not a good start. I thought it wise to head back the direction I came from and head home. As I walked back, I found the trail. I estimated left was to the car and right was to the mountain. I stood there for a solid 5 minutes thinking of what to do. I turned right, figuring if I get lost again I can always head back later. About a mile up the trail I read a sign directing me to the Lakes of the Clouds. I was on the right path, and daylight began to show, making the trail more visible. I started to feel a little safer, and naturally my pace quickened. I was covering ground quickly, averaging 8 mph on a pretty good grade. My pace was slowed when I hit the mountain wall. The trail became so steep at some places it required me to climb on all fours to gain ground. I was careful not to look down or look up, as I only focused on each rock as I climbed higher. I was wearing an altimeter on my wrist and climbed 2,220 feet in 22 minutes. I stayed hydrated drinking 6 ounces of water every 15 minutes, but I was down a water bottle and would be forced to purify river water with iodine tablets. As I said, prepare for the worst. I was not worried about a thing, and I felt like I was on cruise control, but the hardest part was still to come. I reached the Lakes of the Clouds by 6:45am. There is a cabin at this point on the trail, and people can make reservations to stay here, although not many do. It’s a great pit stop before tackling the summit, but I had no time for that. I shook hands with one who was staying there and he wished me luck on the rest of my trip. I stopped at one of the lakes to fill up my water bottle before ascending the final 1.2 miles across the mountain’s edge to the summit. The trail beyond the cabin is faint, although many visit the mountain few actually hike/run to the top. Most drive, where they can purchase a bumper sticker that reads, “This car climbed Mt. Washington,” and those who do tackle the mountain on foot usually take the longer, less technical Jewel Trail. Thus I was left connecting the dots between stack of stones that indicated where the trail lead. This would have been great on a clear day, but the fog was dense and visibility was no more than 150 feet. Winds reported 40 mph and temperatures dropping to 37 degrees made for a difficult read on the vague outline of the Crawford Path and I found myself off course again. I found a large rock and hunkered down to read my map. Using the compass I estimated I was .2 miles off course heading northwest. Not bad, I thought. I took a slug of water and started to walk northeast. Before long I spotted a large stack of stones identifying the Crawford Path. I began to run again. I was at 6,000 feet above sea level and baring in on my goal, but I missed the turn somewhere and found myself crossing the path of the famous Mount Washington Cog Rail Line. I knew this was wrong, and checking my altimeter once more found I had descended 120 feet, thus I was heading down the mountain before reaching the top. I didn’t want to turn back, and I knew the Cog Rail Line went to the peak so I decided to follow the tracks. The footing was awful, but I took one step at a time and kept climbing. I finally came to another large stack of stones, so I decided to investigate. Sure enough, there was a trail that led uphill, and being this close to the top, that was where I headed. The weather lived up to it’s reputation and the fog was so dense I was 100 feet away when suddenly the great observatory was before me. I had made it, I had climbed the rock in a little over and hour and a half. Not bad, all things considered. My first attempt, ran solo, and the weather conditions. Thank God I had brought my winter supplies. I did not stay long, as no one was in the observatory, I tucked in a corner, ate a little granola, slugged some lake water, and began my descent. The less romanticized part of mountain running are the descents, but I do love them. Going downhill is just as difficult, if not more so. Running down a mountain face is dangerous. One loose rock, a bad step, or loss of focus, can send you down hard. Running down a mountain face complements running up the mountain very well, as running up requires more brut strength and running down is more of an artistic dance between steps. It’s beautiful really. Once I found a good footing I began to really move, I dropped 2,000 feet in 16 minutes. I was beneath the devastating fog now and could see the Mount Washington Hotel below. Running to a target from 3,000 feet above it can be frustrating because the target feels like you could simply jump to it in one big leap. In reality the Mount Washington Hotel really was 4 miles away. I continued to dance downward and found myself at the base of the mountain by 8:15am. My legs were beneath me and I felt great. I clipped out the extra mile back to my car in 6 minutes flat. When I made it back to car, folks were gearing up to make their attempts at hiking the great mountain. There was a fundraiser going on as well, and one of the ladies saw my bottle and asked if I had lost a water bottle. I replied with an excited “YES!” and asked where she had found the bottle. She told me it was on the ground at the start of the trail. We laughed, she asked if I made it to the top. I proudly told her I did. It was now 8:30am and I was finished, I wanted to go back up again. I will soon, more experienced, and faster than before. Running is a great hobby, running ultra trails is an awesome feeling. When the trail calls, seize the moment. Do something great for yourself. It’s a big world, explore all you can. I run to be TriJake, balance – endurance – power.